Do you remember a few weeks ago we were going to build a scarecrow in the garden? I had ideas of some that looked like this. While away a couple weekends ago I received a text with a picture of this guy. 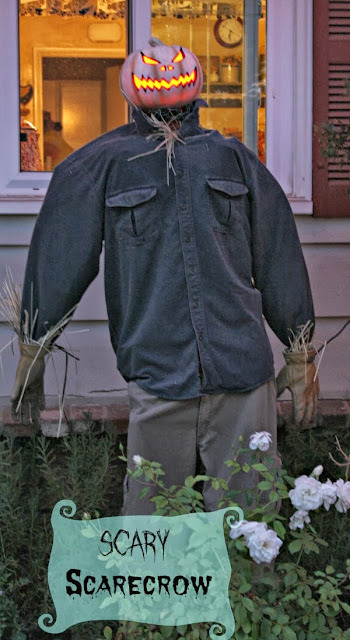 Hubby had made my scarecrow alright and it was downright scary. The head lights up and instead of it in the garden he put it right in front of my kitchen window. Now, I don't want to sound like I don't appreciate the effort but seeing that big guy and glowing head in the window is a bit unnerving. 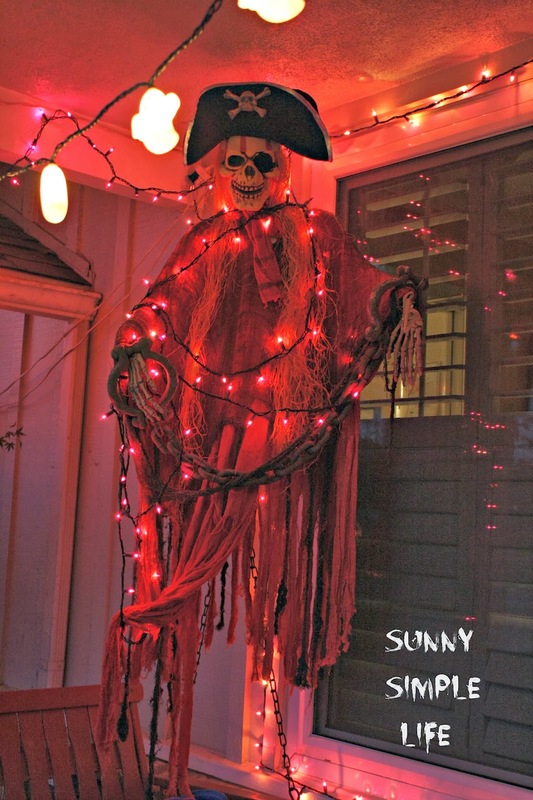 I think I will suggest he come down right after Halloween. Well, all in good fun. 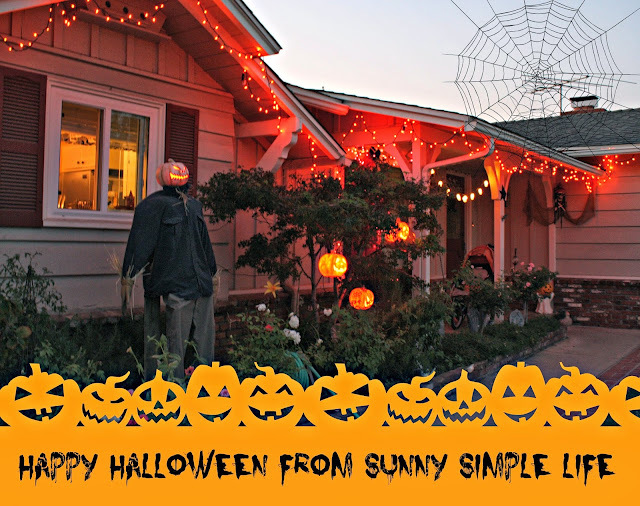 We love Halloween around here and decorate everything you can. Here is our front yard at dusk. On Halloween night we set out a fog machine and eery sounds and get ready for all the trick or treaters. We take a few of the huge candy bars and make homemade labels for them: best costume, cutest costume, scariest costume. Hubby randomly pics a few kids and rewards them at the door with one of the huge candies. Just a little tradition our family keeps up each year. Aargh!! Happy Halloween mateys!! This guy graces the corner of the front porch. Bought when pirates were all the rage. I love your yard! And I love your tradition with the big bars and homemade labels. Just may have to do that!!! Wow, you really are in the Halloween spirit! Love it. What cool looking Halloween decor. I'm sure the kids love stopping by your house for a treat! Love it! Love your scarecrow and all your Halloween decorations! That scarecrow will sure keep the birds away. Bet the kids all have your house on their Halloween Trick or Treat list!! Cute ideas and décor. Looks great and sounds like so much fun! It's one of the few things I don't like about living in the country - no trick or treaters.